This is for all the "Mothers" out there....both in flesh and in spirit. A woman does not need to give birth to be a mother....she merely has within her heart the heart and love of the Great Divine....and she allows that light to shine upon those whose paths she crosses in her journey...... For You! This morning I awaken with thoughts of my children on my mind. Perhaps the thoughts were there so deeply this morning because of the new one growing in leaps and bounds yet in my womb. I am reminded every moment of everyday these past 8 months of the gift and opportunity and not to mention holy occupation that I have been given and called to be and live. I am a representation of the divine feminine in its most basic attribute. That which brings forth life. That which maintains and nourishes life. She who gives wings to another in order for that one to fly off and take its place in Life. 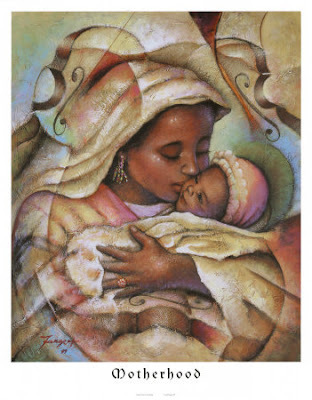 For years I told people that I was an artist first and foremost who happens to be a mother. Then there were certain events that took place in life that challenged me to really step up to the plate and choose what was important, what I needed to do for my child(ren). Without hesitation the inner fierce protective lioness came out. It was in that moment that I understood that I am first and foremost a Mother. I realised that it was a Divine gift and calling that I could no more neglect or qualify as the need to breathe or blood properly flow through my body. I realised that it was my purpose (beyond duty or obligation) to set aside my self for the needs of the souls that were bestowed to my care. Teaching my children lovingkindness, compassion, hope, gratitude and the attitude to trust and believe in themselves and to love themselves and those who are considered to be "other" is what my purpose is. To represent compassion. To be there for them when they need me...even when it is not convenient for me is only part of the mission. To show them unconditional love, assist them in their growth in becoming who they are...is still part of it. Motherhood is a holy occupation that knows no limitations and knows know end. She is Love personified, Mother. Yes, such deep thoughts, emotions, feelings so early in the morning. I can only thank my yet to be born child for kicking me through out the day thereby reminding me who I am. My eldest two are teenagers...teens who are very independent but at the same time will come to me at least once or twice a month and curl up in my arms lying their head on my breast and telling me how much they love me. Yes, even they still need me. My current youngest is eleven. He is independent in his own right but there are even more times when he expresses the desire to be in my arms and to be held by me and exchange the love breath with me. On the outside he is a big boy, solid like an oak tree...on the inside he is the Gift of Life given to me to nourish and support to manhood--and possibly beyond. It is a mother's Love, unconditional love expressed, that helps a person to fully realise who s/he is and what s/he is capable of accomplishing. Motherhood is the best way for me to mature and become the best that I AM meant to be as well. Thank You Spirit for this opportunity to serve.